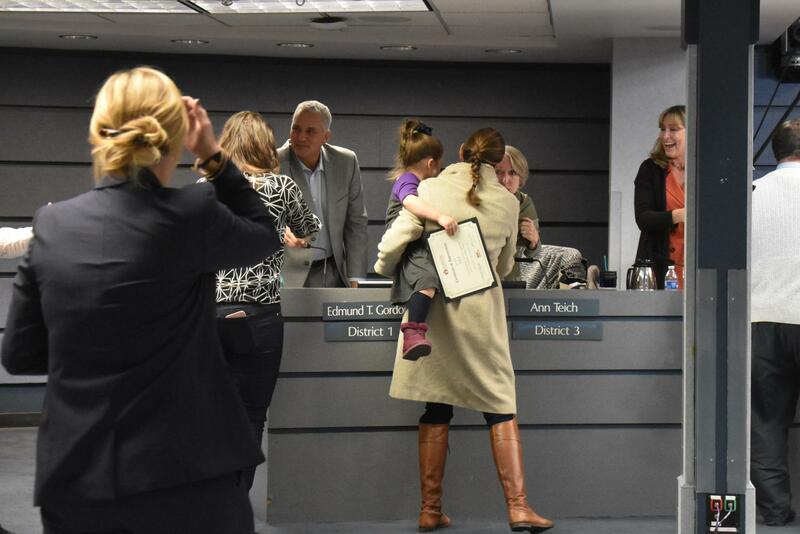 Kristin Ashy, who recently was elected to the Austin ISD Board of Trustees representing District 4, is sworn in by exiting District 4 representative Julie Cowan while her husband and children watch from behind. Photo by Olivia Watts. Monday’s Board of Trustees meeting was a busy one. 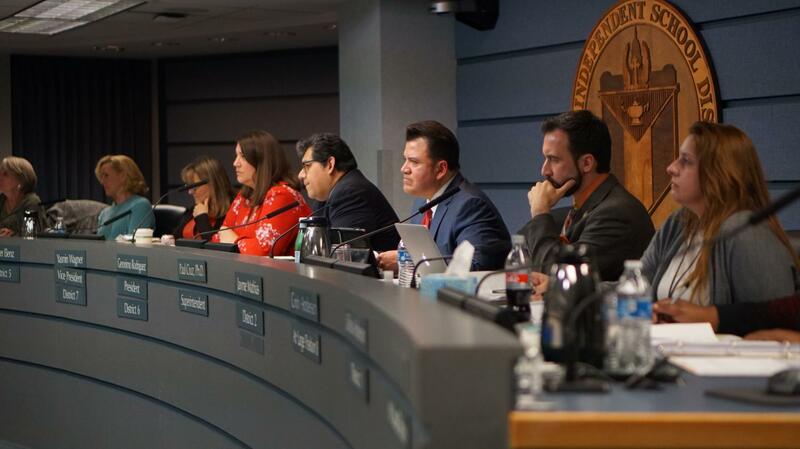 At the meeting, the board swore in newly elected trustees and thanked those trustees that were exiting the board. 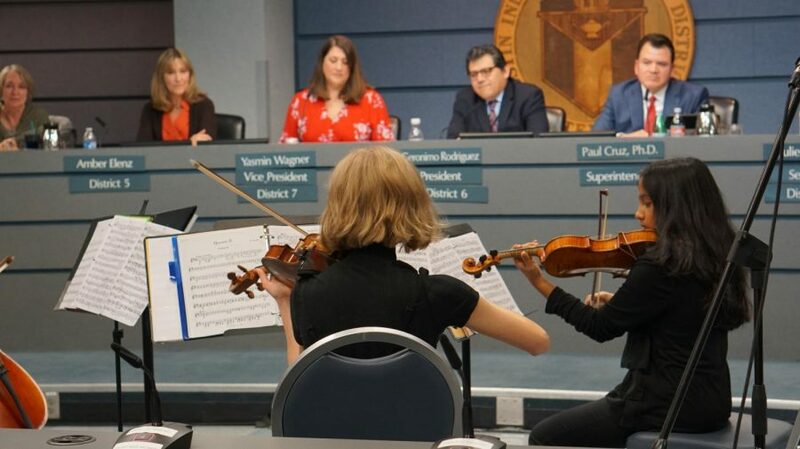 Four McCallum orchestra members — Julian Casas (cello), Lucy Hamre (violin), Mason Shackelford (viola) and Kavya Srinivasan (violin) — performed to mark the occasion. 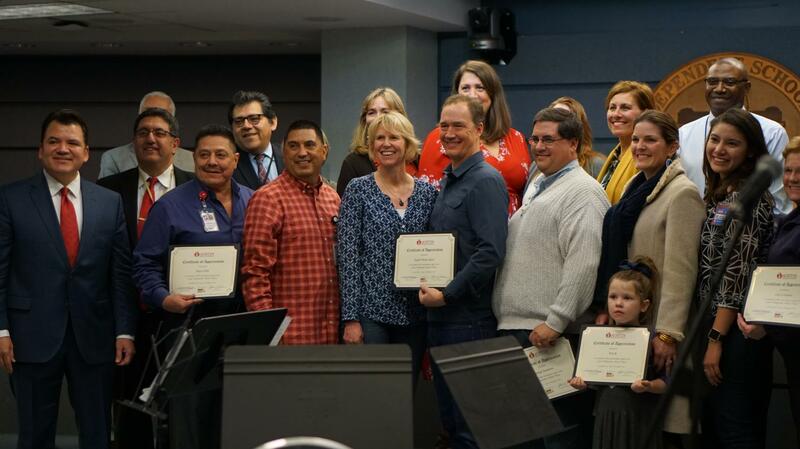 The board thanked many community organizations and individuals for their service to the district. 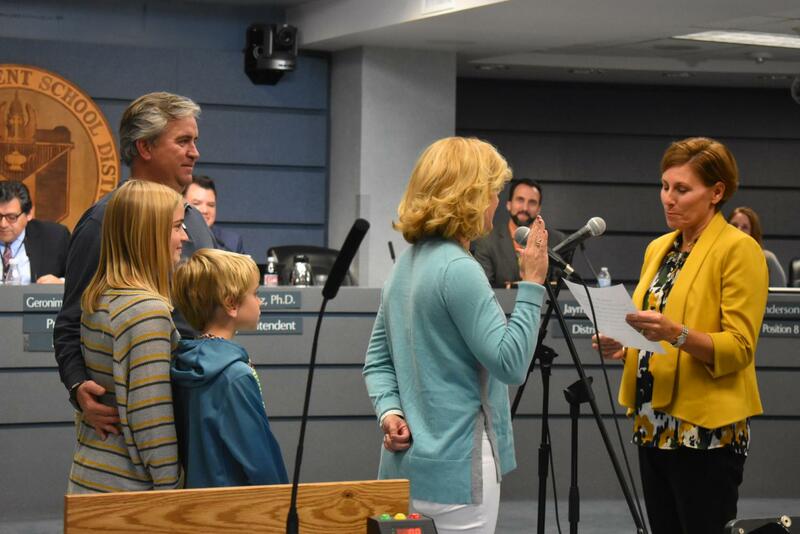 The board also officially acted to rename on of the AISD schools named after a historical figure with Confederate ties when it voted to rename the Allan building (which at one time housed Allan Elementary) after Anita Ferrales Coy, a former principal & district administrator. 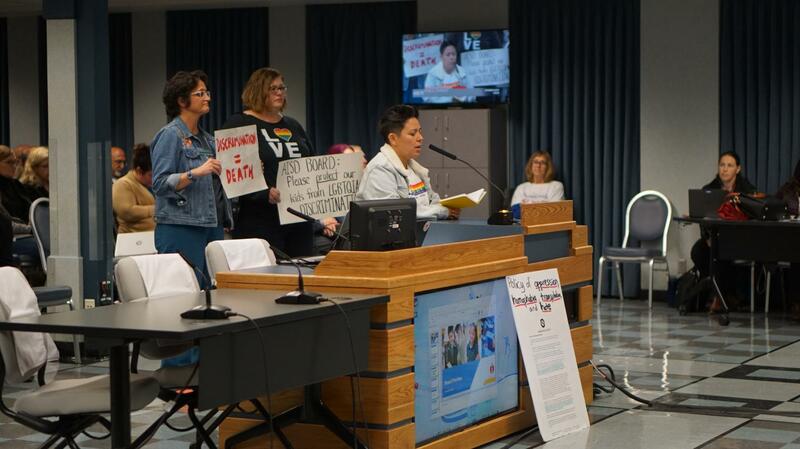 During the open forum period of the meeting, a group of former Fulmore Middle School students joined the daughter of longtime educator Sarah Lively to propose that Fulmore be renamed after her. 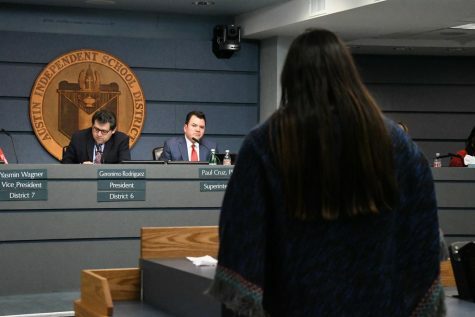 The board ultimate took no other action to rename the other three AISD campuses named after figures connected to the Confederacy in some way. 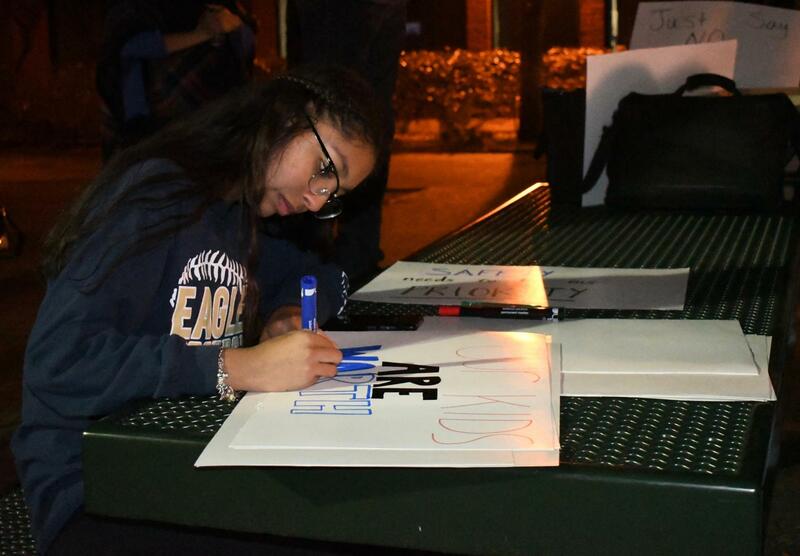 Prior to the meeting, Education Austin sponsored a rally to raise awareness and protest some the proposed solutions to AISD’s budged deficit. 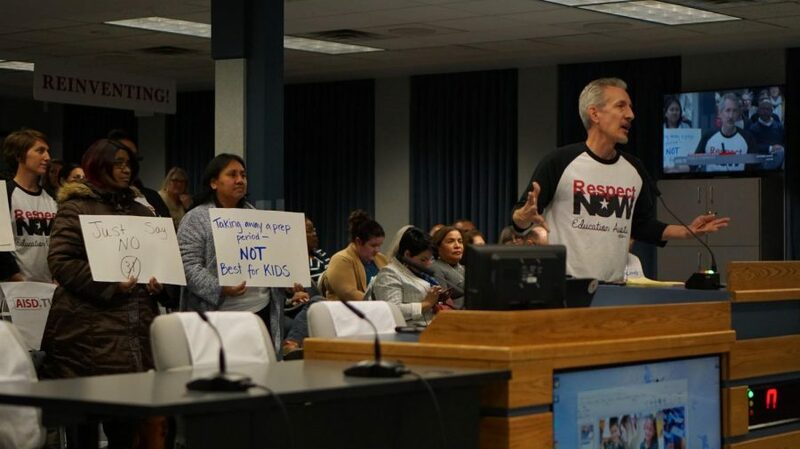 Education Austin president Ken Zarifis urged the crowd to speak up in negotiating a budget that would best suit the needs of all AISD students and teachers. “That’s what we’re here for; we want to know if this is best for kids, and we don’t think increasing class sizes is best for kids so we want to stop it,” Zarifis said. 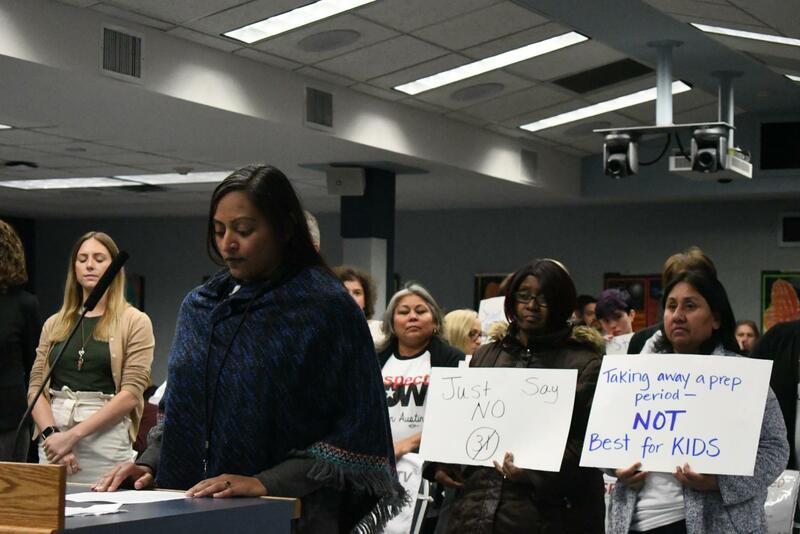 After the rally, the group joined the AISD board meeting for public comment, where they faced the newly sworn-in Board of Trustees in advocating for fair class sizes, planning periods for teachers and better pay for teachers. We are pleased to share our exclusive photo gallery of images from Monday’s eclectic and energetic Board of Trustees meeting. 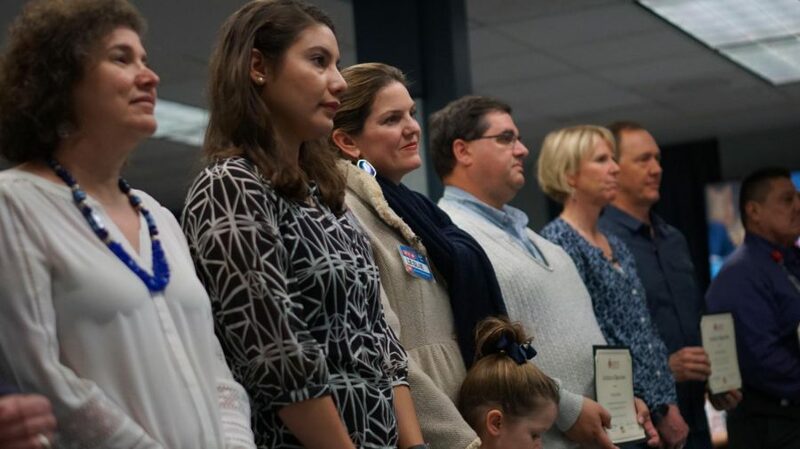 The people recognized for their helpful contributions and actions toward the district stand in a line with their certificates as they listen. Photo by Elisha Scott. 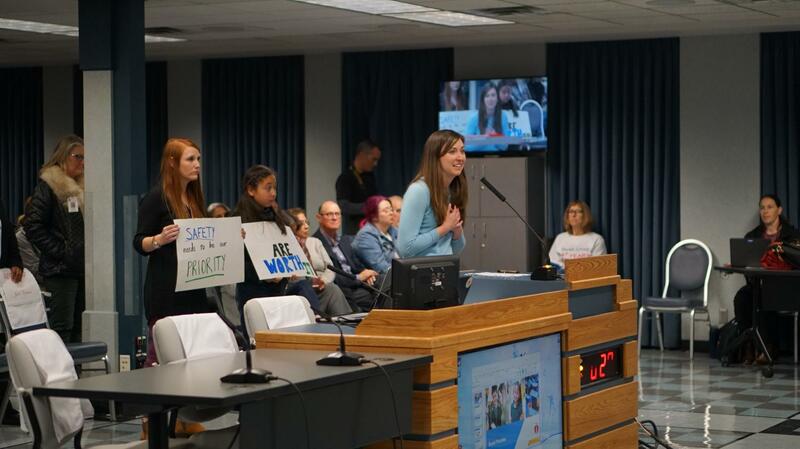 A Williams Elementary School teacher speaks to the board about her concerns of the lack of security in her school as supporters stand behind her with signs. 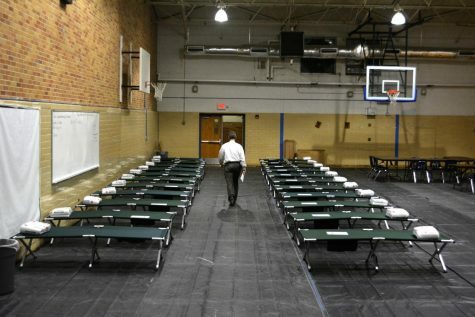 The school doesn't have proper walls separating the classrooms, enough safe places for students in the case of an emergency, or enough staff to supervise recess safely. Photo by Elisha Scott. A woman speaks to the board about the safety of and discrimination against the LGBTQ community and people in AISD. 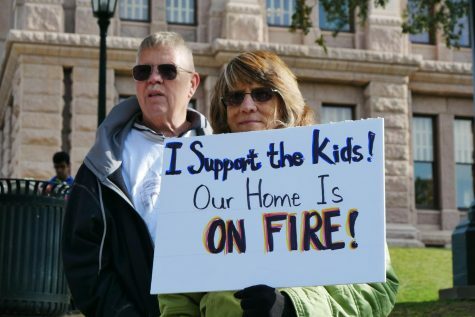 She criticized Celebration Church, which the speakers said discriminate against LGBTQ people. The church rents and holds services at the AISD Performing Arts Center. Photo by Elisha Scott. 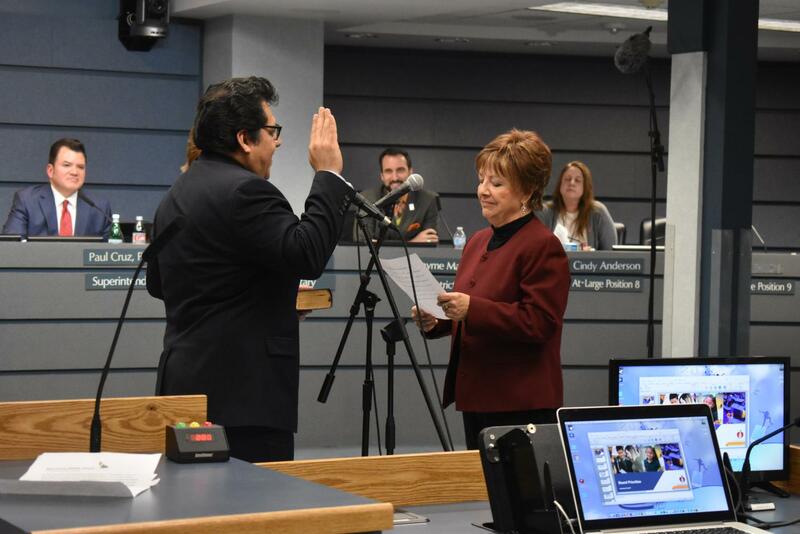 President and board of trustees member for district 6, Geronimo M. Rodriguez Jr., is sworn in at the beginning of the meeting. 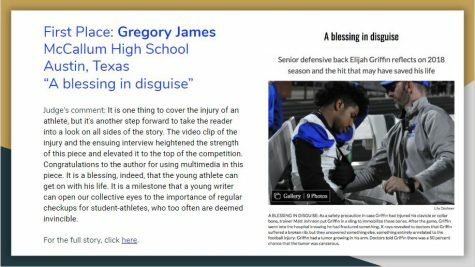 He was appointed to the board in June of 2017 and appointed president of the board in May of this year. Photo by Elisha Scott. Board members (from left to right), Ann Teich, Kristin Ashy, Amber Elenz, vice president Yasmin Wagner, president Geronimo M. Rodriguez Jr., Superintendent Paul Cruz, Jayme Mathias, Cindy Anderson, and LaTisha Anderson (not pictured) listen to community members as they discuss district problems and policies, propose ideas, and give thanks to outgoing board members, former secretary Julie Cowan and Edmund T. Gordon. Photo by Elisha Scott. Students from Baldwin Elementary school recite the Pledge of Allegiance in both English and Spanish at the beginning of the meeting. 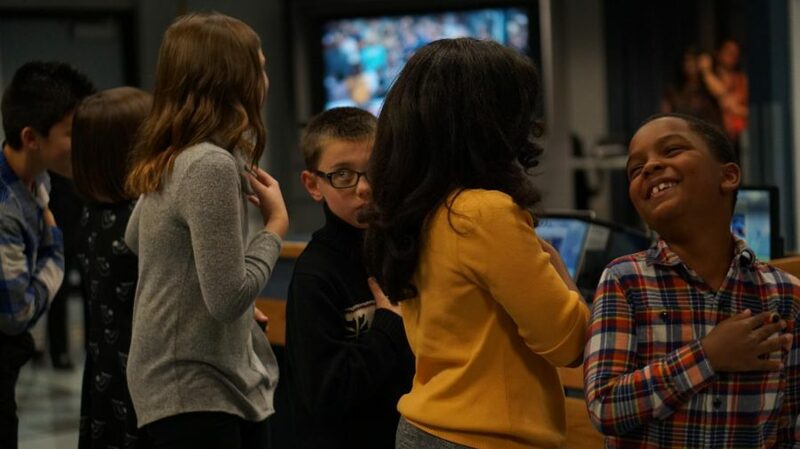 Among the students were outgoing Board of Trustee member, Julie Cowan's niece and nephew. Photo by Elisha Scott. 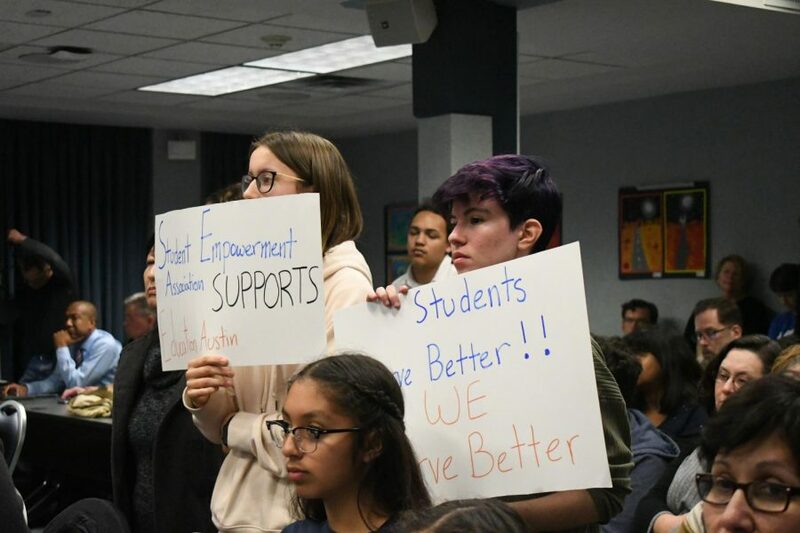 Those in protest of the potential budget for the 2019 school year hold signs during public comments directed at the school board trustees. Photo by Bella Russo. Lucy Harme (left) and Kavya Srinivasan (right) play their violins during their orchestra performance as the board watches and listens. Photo by Elisha Scott. 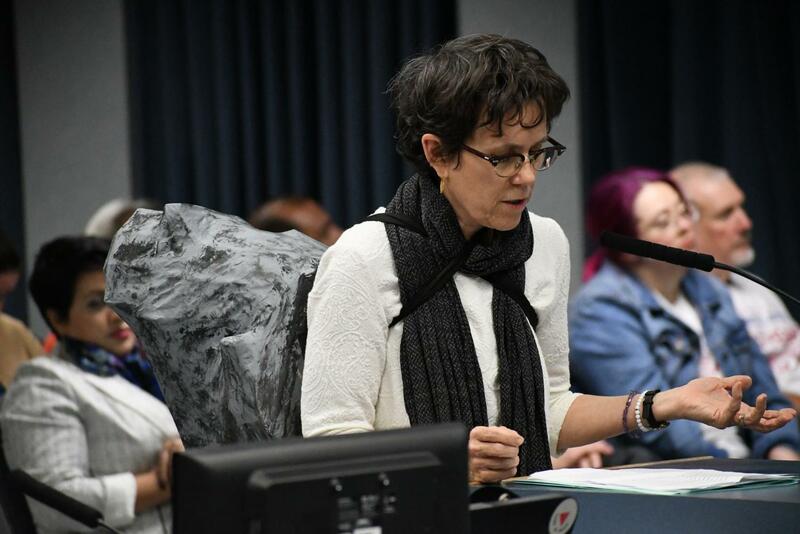 Austin High photography teacher Melanie Sherwood advocates for higher pay and the importance of planning periods, a paper mache rock on her back to symbolize the strong foundation teachers provide for the education and critical thinking of their children. Photo by Bella Russo. 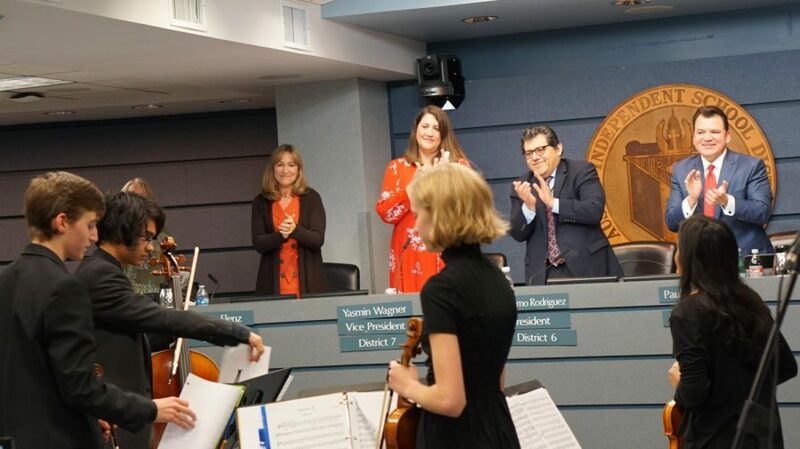 The Board of Trustees members and Superintendent Paul Cruz applaud a quartet of McCallum orchestra students after they finished their piece. Following the performance, Trustee and former orchestra player herself, Ann Teich, explained how difficult the different aspects of the performance were. Photo by Elisha Scott. 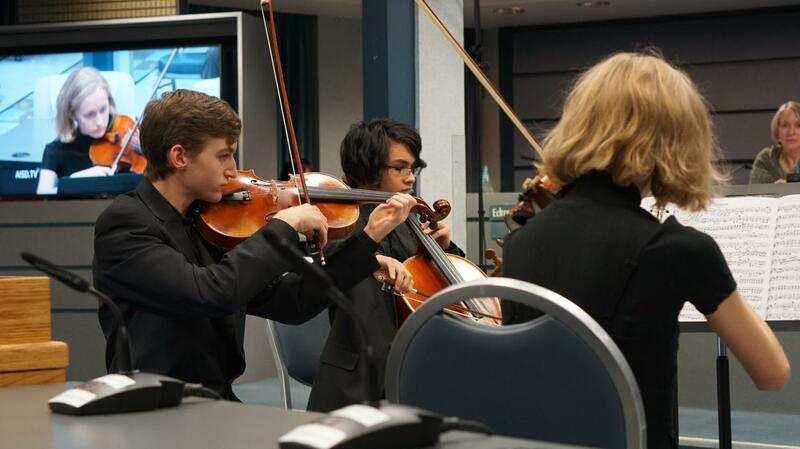 Four MAC orchestra students, Juilan Casas, on the cello, Mason Shackelford, on the viola, Lucy Hamre, on the violin, and Kavya Srinivasan (not pictured), on the violin, perform their piece for the board at Monday's meeting. Photo by Elisha Scott. 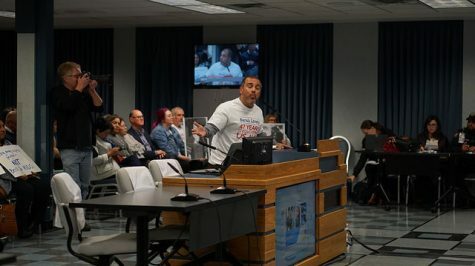 Education Austin president, Ken Zarifis, speaks in front of the board at Monday's meeting to oppose proposals to have teachers teach seven of eight periods or to add 2-3 students to the average class size for district teachers. Photo by Elisha Scott. The board takes a picture with all of the people recognized for their services and contributions to AISD in the last month. 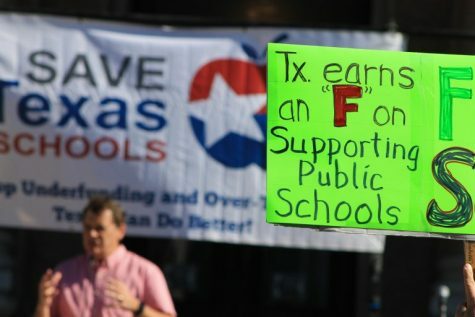 This included businesses like H-E-B and Super Cheap Signs, the Hays CISD school district and people such as George Sabi. Photo by Elisha Scott. 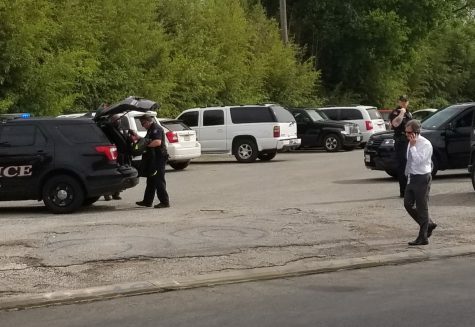 Austin ISD board member Ann Teich and exiting board member for District 1 Edmund Gordon shake hands with donors who donated water to the district during the water ban. Photo by Olivia Watts. 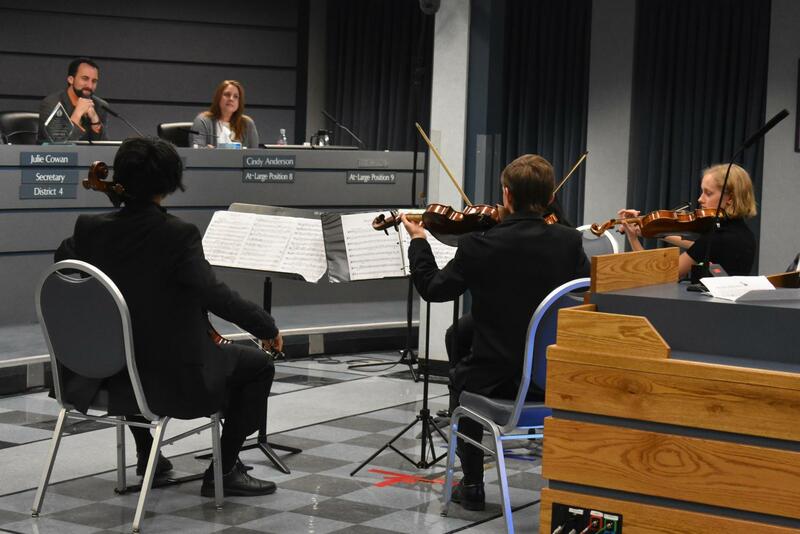 Four McCallum orchestra freshmen, Julian Casas (cello), Mason Shackelford (viola), Lucy Hamre (violin) and (not pictured) Kavya Srinivasan (violin), play a piece for members of the Austin ISD Board of Trustees during Monday evening's board meeting. Photo by Olivia Watts. 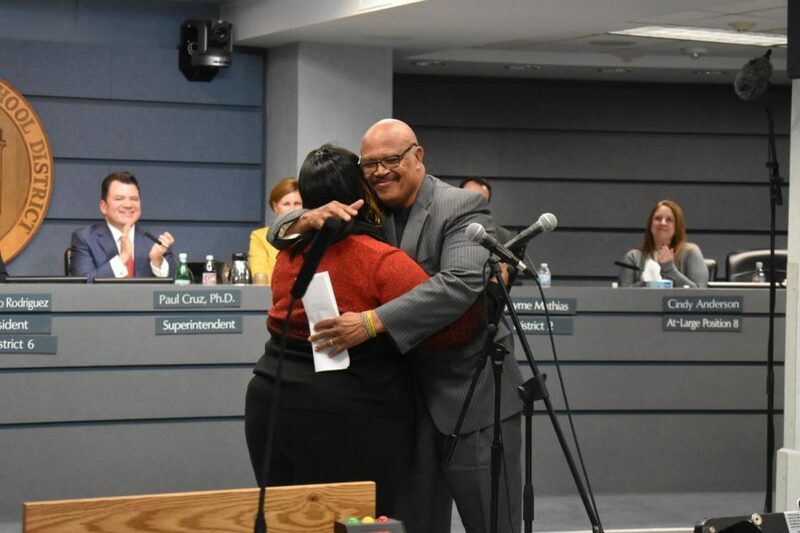 Newly elected Austin ISD Board of Trustees Member LaTisha Anderson hugs her former teacher who swore her in to her new position representing District 1. Photo by Olivia Watts. 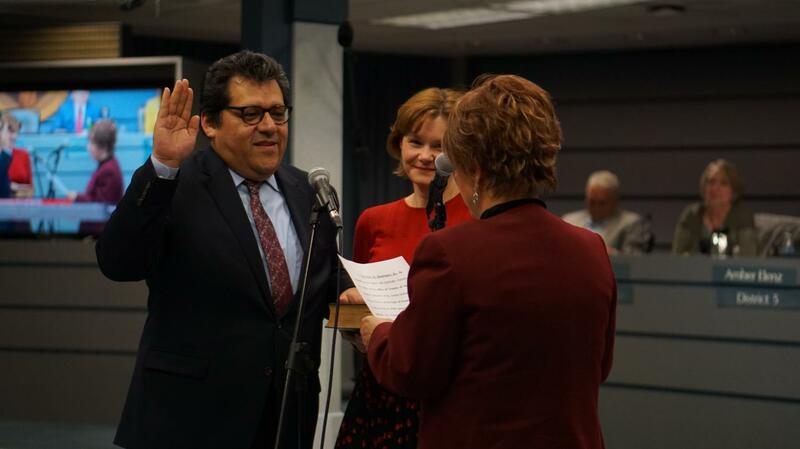 Austin ISD Board of Trustees President Geronimo Rodriguez, who was reelected to represent District 6 is sworn for the second time. Photo by Olivia Watts. 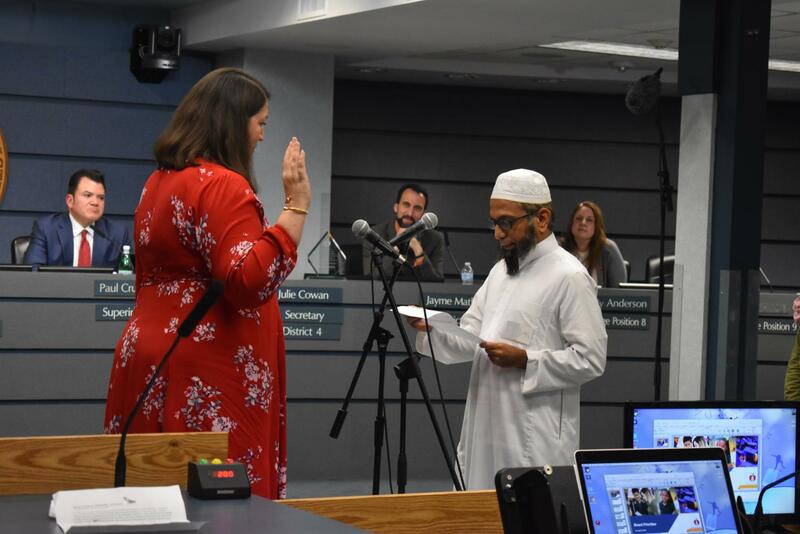 Yasmin Wagner, the Austin ISD Board of Trustees' reelected vice president, is sworn in by a Sikh from a local mosque. Photo by Olivia Watts. Photos by Bella Russo, Elisha Scott and Olivia Watts. 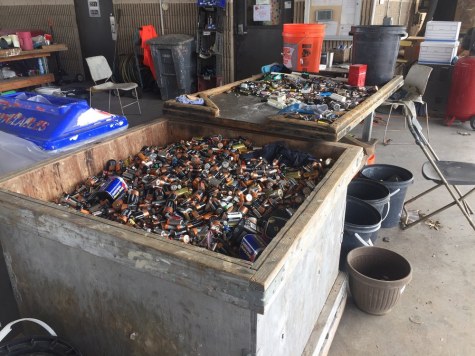 I think this was a good topic to do a story on because it is a problem that it is going to impact us right now.